There are many shops in Prague and other Czech cities that sell traditional Czech products, such as handmade soap, beeswax candles, dried flower arrangements, natural cosmetics, wooden toys and other traditional Czech handicrafts. Below are some of the better known shops. Czech Tradition is a chain of stores offering traditional Czech handicrafts made by skilled Czech craftsmen and artisans. There are several locations in the center of Prague and a store at the airport. 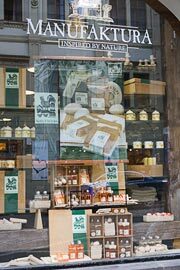 If you like natural cosmetics and bath products, look for the Manufaktura branded products that are sold at the Czech Tradition shops (see above). They may not be available at all of the locations, but you should find them at Melantrichova 17 and Mostecká 17. Online shopping also available. Established in 1992, Botanicus specializes in natural products, such as handmade soaps, beeswax candles, dried flowers, potpourri, scented oils, etc. The store has grown over the years and now has multiple locations around the Czech Republic with seven locations in Prague.